Like most people of my generation, I grew up fascinated by the future. The future as it was seen in movies, comics and tv, a future of supersonic planes, space settlements, computers and monorails, all seen in clean white plastic and harsh concrete edges, a future of straight lines and the triumph of human construction over nature. 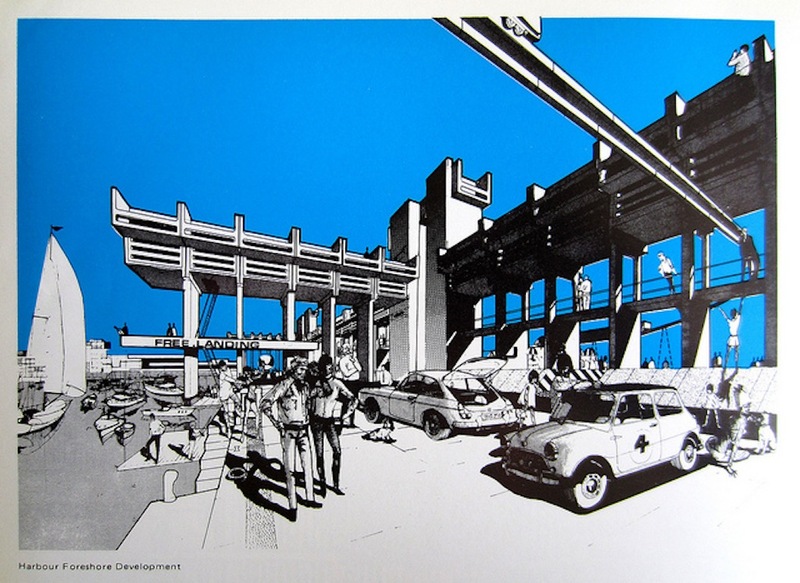 Of course, design has gone away from those concepts, and now we’ve abandoned supersonic travel and monorails, in favour of slower but more economical travel methods. Computers have become common, but in ways that even the most fantastical science fiction authors couldn’t have imagined. And while clean white plastic went out of fashion, came back in fashion when Apple made the iPod, and is now back out of fashion again, concrete has aged badly and is now a symbol of poor planning and urban decay, rather than the monument to the greatness of man over nature that it once was. So while working on a couple of projects lately focusing on the history of our home town (Irvine, Ayrshire), I was amazed to find these images, and many more like them (credit to Bollops for uploading them to flickr originally). 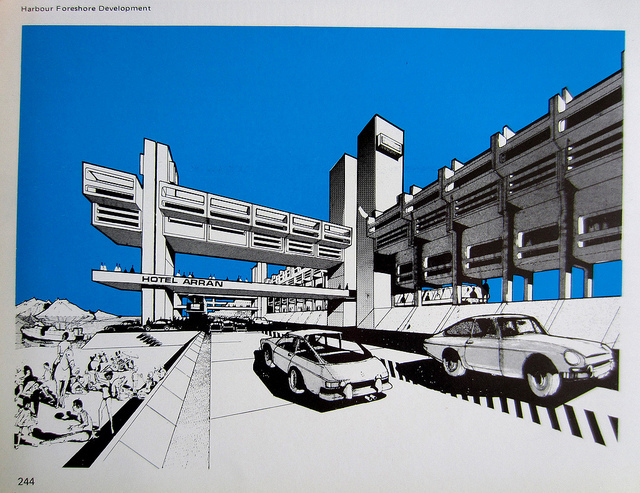 These are images during the redevelopment of Irvine back in the 1960’s and 70’s, and yes in the second image, that is a monorail. Now I find it amazing that these plans existed, that for the small town I live in there existed plans to take it into the future. Now these plans all came to nothing. 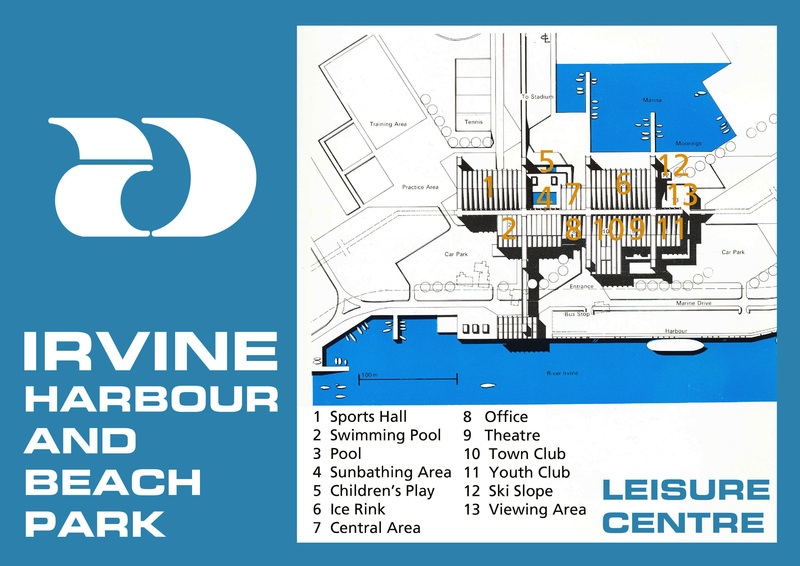 With only phase one being constructed, which is basically just the Rivergate Centre (known at the time of construction as the Irvine Centre) a large shopping centre which dominates the centre of the town. Phase Two of the development would have built onto the shopping centre, connecting it with the train station, and consisting of the entirety of the car park which currently exists between the Rivergate centre and the train station. The area of the Riverway retail park and Cunningham House council offices would have been blocks of flats, connected to the Irvine centre by sky bridges. 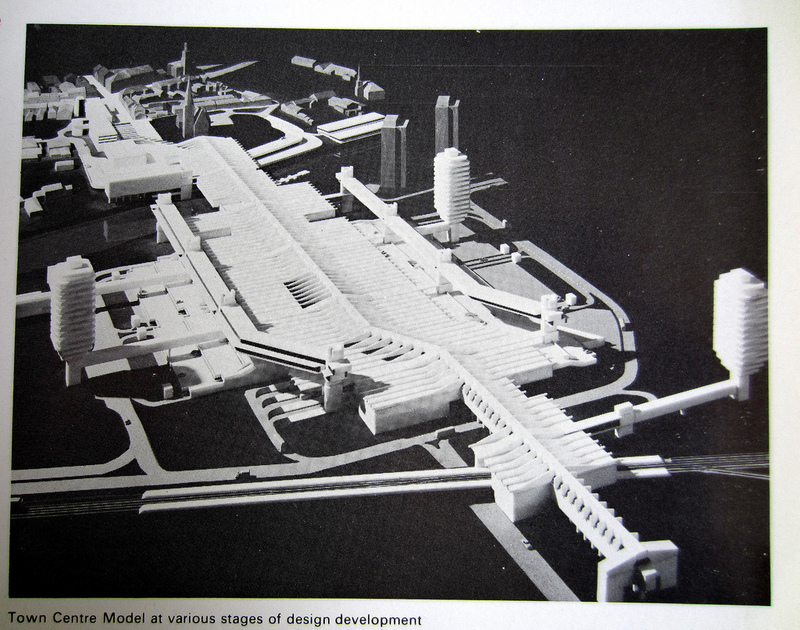 Phase three, took the centre down to the harbourside and beyond into what is now the beach park, and would have involved demolishing that entire area to build new housing estates, which would be served by a monorail. So that the commuters disembarking on the train from Glasgow, could step onto a monorail and be whisked over the heads of the traffic below to stops in their own particular housing estate. 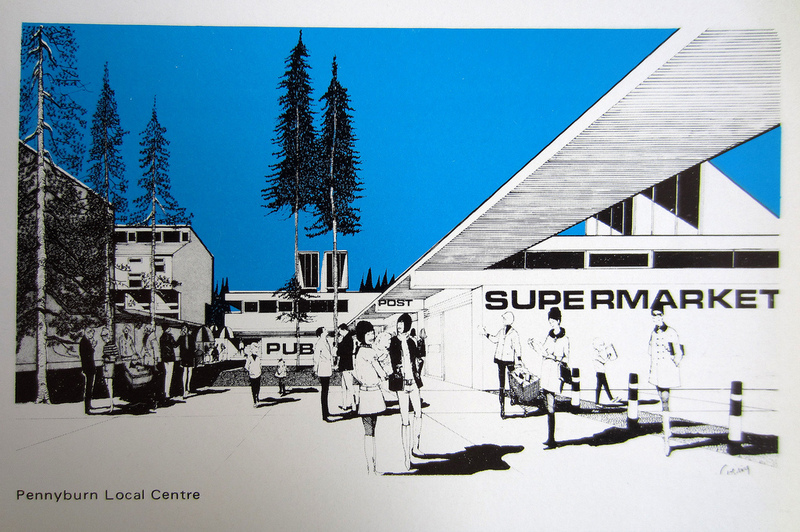 The plans also included various entertainment areas, such as the before mentioned amusement parks, a theatre, ski slope, and optimistically enough a sun bathing area. Now, this would have doomed Irvine’s historic harbour area, and the construction that was completed ripped the heart out of the town. It’s quite remarkable in the development of a town for a redevelopment on the scale that occurred to happen. Usually when old buildings are demolished, the streets remain, and new buildings are build on the land occupied by the old. In most towns, several old buildings will get demolished, and a new one built in their place. However, in the creation of Irvine New Town, not only did the buildings go, but they demolished the road bridge which was the main way of crossing the river (it’s site is now right in the middle of the shopping centre), and they cleared the land completely. So roads that had existed for centuries were wiped from the maps, and photographs exist of roads cutting across what is now a supermarket or car park, the evidence of its existence forever gone. While this loss of history is regrettable, and the concrete brutalist designs of the era have aged badly and with the benefit of hindsight were pretty darn ugly to start off with. 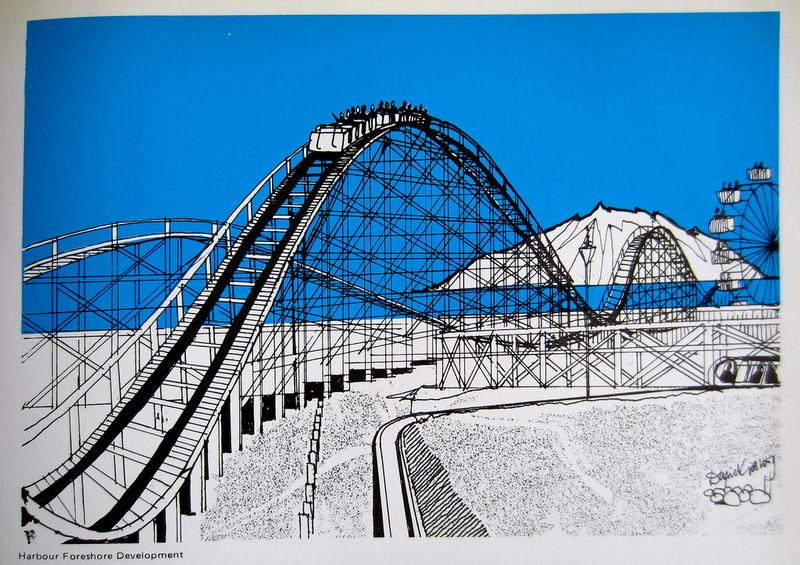 I personally find the optimism of that era to be quite contagious, but maybe that’s just the little boy in me that grew up watching Space Shuttle Launches, Concorde flights, and way to many episodes of Stingray, who dreamed of living somewhere high-tech and futuristic, probably somewhere with a monorail. Previous PostPrevious And they’re out! Next PostNext What is HTML?